Driving is an essential skill and one that opens a lot of doors in both your personal and professional life. It affords you freedom, independence and a quiet sense of confidence. For many learners, driving lessons are something to look forward too, however for many individuals who are just starting out, the thought of getting behind the wheel can often feel them with dread and make them very nervous. New learner nervousness, especially when severe, can make lessons difficult and in some cases lead to students abandoning driving altogether, usually because they feel they’ll never be able to overcome the feeling. 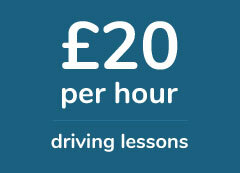 One way new learners – especially female ones – conquer the feeling is to learn with a female driving instructor. In general we learn better when we are calm and relaxed and as learning to drive can be a stressful process, anything we can do make ourselves feel more settled, is certainly a good thing. An Approved Driving Instructor (ADI), will teach the DVSA driving syllabus, irrespective of their gender. The choice to learn with a female driving instructor, as oppose to a male one, is less about the standard of teaching and more about how the student feels while learning. If you’re suffering from severe nervousness and a lack of confidence, learning with a female driving instructor, might be just the thing to help you overcome this issue and here are a few reasons why. Trust between instructor and student is a critical part of the learning process. We tend to learn more effectively when we trust our teacher’s and many female learners find it easier to form a bond a female driving instructor. A genuine bond with your driving instructor will help you feel laid back and relaxed and this should lead to a better lesson and a much improved driving experience. On average a new learner needs 42 hours of tuition before they are ready to take their test. As you’ll be spending a considerable amount of time with your instructor, it helps if you have things in common and many female learners choose to learn with a female driving instructor for this reason. Female learners often feel they have more shared interests with a female driving instructor, as oppose to male one and this helps them remain engaged, as they’re able to find things to talk about other than driving, during natural lulls in the lesson. Unfortunately we live in a society where there’s still a negative stigma attached to female drivers. We’re often told that female drivers are worse off than men, that they can’t park and they have a terrible sense of direction, yet their insurance premiums are consistently lower than male drivers. All new learners are prone to making mistakes during their first few lessons and it’s easy for a female learner to make an error and then believe the stereotype and stigmas to be true, which further compounds the error, leading to a loss of confidence. For female learners who are struggling with confidence issues, learning with with a female driving instructor will often reassure them that they are just as adept as their male counterparts and the negative stereotypes are no reflection on their driving ability. Learning to drive is a process full of ups and downs and all students learn at their own pace. Some learn quicker than others, while some struggle to grasp the concepts they are taught. Learners who know they’ll take a bit longer to get their heads around a specific concept, often prefer to learn with a female driving instructor, as they deem them to be more patient. Many learners need to feel they have the time and space necessary, to make errors and gradually correct them at their own pace and for such learners, choosing a female driving instructor is generally a good move. Confidence plays a big part in driving. Many drivers, both experienced license holders and new learners, struggle with their confidence behind the wheel. It’s a significant reason why many people start their driving lessons, but fail to complete the process. Sentiment among many learners is that female driving instructors are likely to improve their confidence, while teaching the necessary skills to help you drive safely and pass your test. If building your confidence while driving is something that appeals to you, or something you actively what to improve, opting to learn with a female driving instructor could be a sensible thing to do. Although there are soft differences between learning with a female driving instructor as oppose to male one, the aim should be to learn how to drive safely, while passing your test in the shortest possible time and the standard of tuition you receive should be the deciding factor and not the gender of the instructor. In saying that, it’s a fact that some learners prefer and learn better when taught by a female driving instructor and if you feel this could refer to you, fill in the form below and one of our friendly team will get back to you shortly about booking a driving lessons with a female instructor in your area.